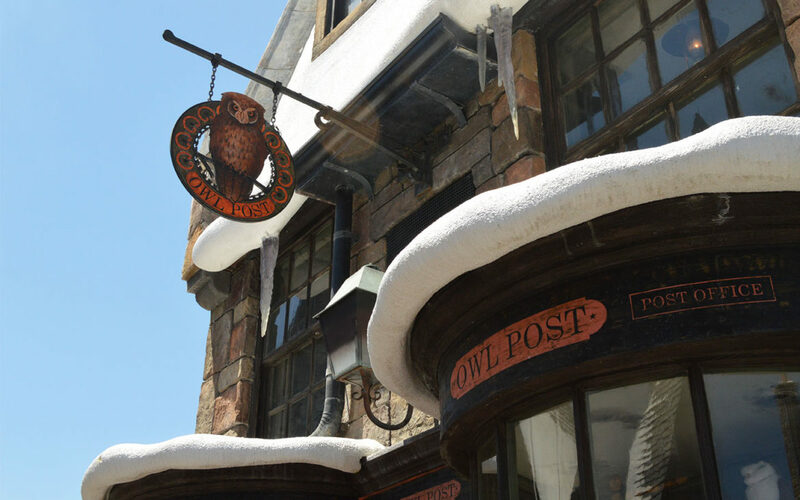 One of my favorite hidden gems at The Wizarding World of Harry Potter—Hogsmeade at Universal Orlando Resort is Owl Post. This fun shop is located next to Ollivanders wand shop in the center of Hogsmeade. At Owl Post, you’ll find a variety of stationery and writing implements like feathered quills and beautiful parchments. You’ll also find some beautiful owl plushes and other gifts. 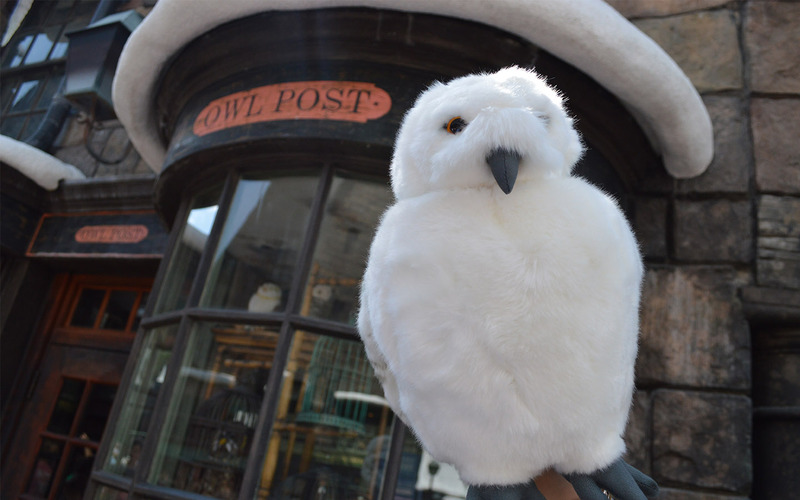 A fan favorite is this cute Hedwig plush. But one of the coolest experiences at Owl Post is mailing a letter with a special Hogsmeade postmark! First, pick out your stationery and jot down all of the adventures you’ve had and memories you’ve made so far in The Wizarding World of Harry Potter. Next you pick your choice of stamp for your letter. My favorites are the ones with the beautiful shot of Hogwarts castle. Once you’re ready to mail your letter, you’ll receive a special Hogsmeade stamp on your envelope before you hand it off for delivery. Next time you’re in The Wizarding World of Harry Potter – Hogsmeade, share your own adventures by mailing a letter to a friend or family member. 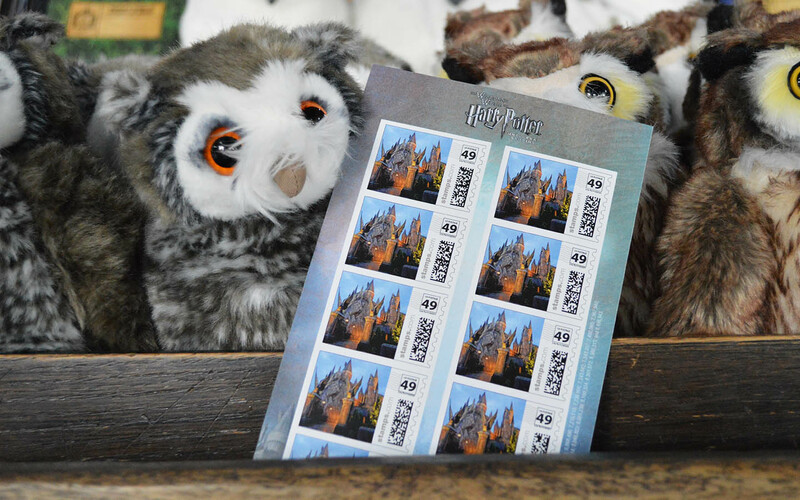 Would you like to receive mail from the Wizarding World of Harry Potter before your next visit? You can send us a self- addressed envelope and we will return it to you straight from the Wizarding World of Harry Potter! This is a great way to surprise someone with a vacation to the Wizarding World of Harry Potter or just a special treat for any Harry Potter fan! Read all of the details about how to receive your own mail here.